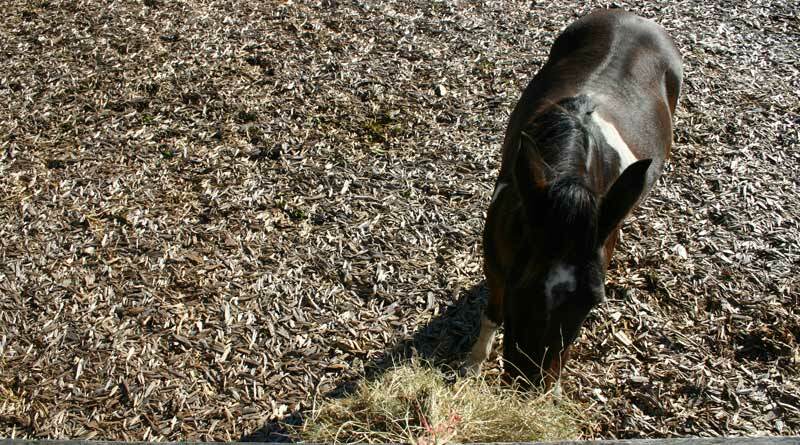 Restricted forage-based rations are at the heart of dietary management of equine metabolic syndrome. Key guidelines for treating equine metabolic syndrome (EMS) in horses have been released by a panel of experts. The recommendations are contained in a consensus statement issued by a panel gathered under the umbrella of the European College of Equine Internal Medicine. The eight-strong group described EMS as a widely recognized collection of risk factors for endocrinopathic laminitis. The most important of these risk factors is insulin dysregulation. “Clinicians and horse owners must recognize the presence of these risk factors so that they can be targeted and controlled to reduce the risk of laminitis attacks,” the authors said in their statement, published in the Journal of Veterinary Internal Medicine. Diagnosis of EMS is based partly on the horse’s history and clinical examination findings, and partly on laboratory testing. EMS is controlled mainly by dietary strategies and exercise programs that aim to improve insulin regulation and decrease obesity where present. In some cases, they said, pharmacologic aids might be useful. Obesity, they said, is no longer seen as a sole cause of EMS but rather a commonly associated feature that, when present, can exacerbate insulin dysregulation. Nutritional strategies for management of obesity primarily rely on energy restriction centred around a forage-based ration. In general, grains or cereal‐based complementary feeds, fruit, or vegetables such as carrots, apples, or treats should be excluded because of their high non-structural carbohydrate content. Likewise, high‐fat feeds should be avoided in overweight horses because of their high energy contents. “There is debate about the optimal degree of restriction owing to concerns about not meeting minimum roughage requirements,” they noted. The authors noted that there was considerable individual variability in proportional weight losses among horses put on a diet, leading to the categorization of individuals as either sensitive or resistant to weight loss. In horses resistant to weight loss, further forage restriction to as little as 1.0% actual body mass as dry matter intake, or 1.15% actual body mass as fed, should be considered if appropriately monitored, they said. The nutrient composition of the forage should be determined where possible, although this seemed to be performed rarely in practice, they noted. Soaking reduced the glycemic and insulinemic responses to hay and haylage fed in both normal and insulin-dysregulated ponies, they noted. This is recommended for horses with insulin dysregulation, especially those shown to have abnormal responses to oral carbohydrate challenges. “Soaking hay for 7‐16 hours at ambient temperature decreases nutrients including water‐soluble carbohydrates by 24% to 43% and is associated with more than double the losses of body mass compared to feeding the equivalent amount of dry hay. Forage with a non-structural carbohydrate content of less than 10% is recommended to limit post-meal insulin responses in horses with insulin dysregulation, and soaking may be required to achieve this in many instances. “Ensuring adequate protein, vitamins, and minerals is important via a ration balancer supplement,” they added. The authors said restricting grazing time alone has a limited effect on dry matter intake and can result in rapid consumption, with more than 0.9% of body mass of dry matter intake having been recorded in just three hours on pasture. Grazing muzzles reduce dry matter intake to 77% to 83% of grazing without a muzzle and can have the added benefits of increasing foraging time and exercise. “During the initial 6‐12 weeks of dietary restriction in animals with insulin dysregulation, pasture access should be prevented as even partial access is difficult to quantify in terms of dry matter intake. The use of dietary supplements to facilitate weight loss or improve insulin dysregulation is popular, but their effectiveness remains questionable or unproven, they said. “Supplements including magnesium, chromium, and short‐chain fructo‐oligosaccharides have received support based on some evidence of improved insulin regulation, although other studies have not confirmed these positive effects. Safe rates of weight loss are not well defined, they noted. Although abrupt feed restriction resulting in loss of about 1% of body mass weekly was not associated with hypertriglyceridemia in a study of Welsh ponies, more rapid losses have been associated with issues. Turning to exercise, the panel said the amount should depend on lamellar stability, and the guidelines cannot be applied to horses with current or recent laminitis. “All exercise should be increased gradually based on the horse’s baseline fitness level and with careful monitoring in case of deterioration of lamellar stability, especially in horses with previous laminitis. “In non-laminitic horses with insulin dysregulation, minimum recommendations are low to moderate‐intensity exercise (canter to fast canter, ridden or unridden; or heart rates of 130‐170 bpm) for more than 30 minutes, more than five times per week. The panel said drug treatments for EMS should never be used as a substitute for diet and exercise interventions. Metformin, the noted, appeared to blunt post-meal increases in blood glucose and insulin, so may be useful for horses with severe insulin dysregulation while management changes are implemented, and in animals who remain insulin dysregulated even when managed optimally. Levothyroxine may be used in weight loss‐resistant cases alongside dietary control and exercise. Where pituitary pars intermedia dysfunction (Cushing’s disease) has been diagnosed, pergolide treatment is recommended to minimize the effects of the condition on insulin dysregulation. The panel said monitoring and support were crucial elements of EMS management. “Initial veterinary re-examinations should be performed monthly after starting dietary restriction and then less frequently (3‐12 monthly intervals) once good progress is made. The panel that compiled the consensus statement were Andy Durham, Nicholas Frank, Cathy McGowan, Nicola Menzies‐Gow, Ellen Roelfsema, Ingrid Vervuert Karsten Feige and Kerstin Fey, from a range of institutions. The consensus statement, published under a Creative Commons License, can be read here. Good article. I am not in a hot climate but have been advised to soak hay for a much shorter period. I currently steam before soaking. Would it be beneficial for WSC to soak before steaming ?